The process of ordering books is an inevitable part of higher education yet, each semester I cringe at the amount of money spent on textbooks. As we progress through college, our textbook prices seem to rise with us. While many of us blame our professors for requiring certain books, the flaw is in the publishing industry. Knowing that students are forced to pay the price, publishers drive up prices without fear of repercussion. The College Board recently stated that the average college student spends $1,200 per year on textbooks and supplies. This equals out to about 14% of tuition and plays a significant role in the debt burden of students. 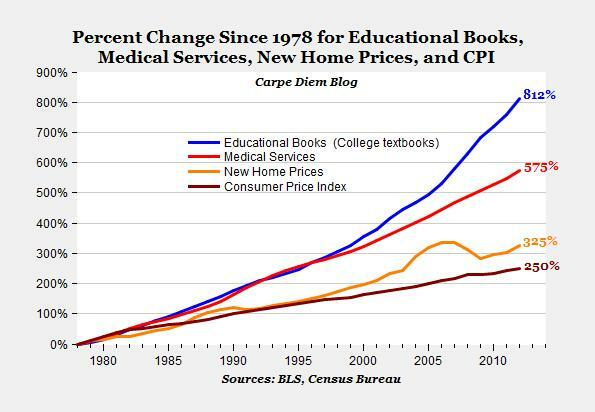 This chart from College Insurrection gives you an idea of how inflated the cost of textbooks has become since 1978 and the rapid rate at which these prices are increasing. While buying our books in stores or on campus has become almost impossible with the prices we would need to be willing to pay, the Internet has answered our cry for an affordable option. With websites like Chegg, we have the ability to buy and even rent both used and new textbooks. By shopping online, it eliminates the role of wholesalers, retailers and distributors. As a result, students save money. Websites such as Chegg are targeting college students who want to save big bucks on textbooks but now, Chegg is finding ways to keep customer retention by branching out and becoming more than just an online book shop. The website has successfully implemented Customer Relationship Management, or CRM, into their interactions with customers. New Directions for Institutional Research explains how CRM works when an organization or company can find new avenues to pursue, in addition to, ways to interact and better serve the customer. Chegg has anticipated the needs of their customers well and this is apparent right on their front page. The website offers help with homework at the same place the students buy their textbooks, as well as, step-by-step solutions for your courses, scholarship connections and course scheduling and reviews. All of these benefits keep their current customers engaged and coming back for multiple reasons. By attempting to be more than just an online bookstore they strengthen brand loyalty and ensure a lasting relationship with students. If all of this textbook talk is stressing you out… Rest easy knowing that there are companies like Chegg out there trying to correct this problem. Congress is even getting involved with the Affordable College Textbook Act, which alleviates some of the financial burden. Though textbook prices will remain an issue for students in the foreseeable future, there is help on the way. What would you like to see done to put a little more money back in your pocket? As a junior at UNCW, I know the pain of purchasing those evil, “required,” textbooks all too well. I didn’t realize just how much the average student spends on books until after reading this post. The dollar amount is staggering and it makes me sick knowing that the greedy textbook publishers are able to get away with charging such prices. I am relieved to learn that companies such as Chegg are doing what they can to alleviate costs of text books for students. While I understand for some professors it is a necessary evil to require a textbook, there are other professors that make you purchase several books and then end up not using them for the class after all. I wish that professors would consider alternatives to textbooks such as the less expensive e-books or simply posting excerpts of books on Blackboard for students to read. Spending all the money I had earned this summer on textbooks was not at all how I envisioned spending that hard earned cash. It kind of makes me miss high school… when the books were FREE! I totally agree with you on the idea of e-books and excerpts versus buying an entire book. Luckily, there are multiple websites that now offer textbooks at a much lower price and allow us to hold on to our money. I appreciate your feedback and I hope that change happens soon! We should never have to reconsider a class because we cannot afford the textbook. I think “cringe” was a great word to use when referring to thinking about having to buy my books for the year. I am on the GI bill and have still not yet received my book allowance so I had to pay out of pocket for all my books and that did not make things easier for me or the move I had to make transferring down to UNCW. I am lucky to even have an allowance coming at all though, so those who aren’t as fortunate need companies like this to help alleviate the stress and burden that is caused by these prices. I also agree with Mckenzie Bass in that I have had to buy books that I ended up never using or opening once, and I can guarantee I didn’t sell it back for what I paid for it. Hopefully something comes from the Affordable College Textbook Act and future students are faced with more reasonably priced materials. I love Chegg and all it has done for my textbook needs. As an out-of-state student, I already pay 3x more in tuition than the in-state students which isn’t cheap by any means. To add about $1,200 to that each year in textbooks is a little ridiculous and hard on my wallet. It’s especially frustrating when most of the time professors say the textbook is “required” as well as access codes but yet by the end of the semester I haven’t used any of them and the bookstore won’t buy it back because access codes can’t be used after the semester ends, and all their other excuses. Sites like Chegg and Amazon have become lifesavers throughout my last 4 semesters here (after my first semester I learned not to buy from the bookstore). I’m excited to hear about ways that textbooks prices can become even cheaper because I just can’t afford a $250 book that I won’t open once anymore. Interesting discussion. Not sure how it relates to IMC though. Are we organizing a campaign on behalf of the lower textbook prices bill? The costs are real but they are inflated because the intellectual property rights that extend to many other products such as songs and movies don’t apply to textbooks. If official sellers of used books had to pay a royalty just like radio stations pay when they play a song, this would solve itself. Textbook companies must make 3-5 years of profit off of the initial sale because they won’t make any money on the used book sales. That means that authors–often your basic faculty member trying to write a book to keep his/her job or send his/her kid to summer camp or college doesn’t make anything either. So, once again, the system has structural inequities that we are trying to solve without changing the structure. Not smart. But hey, it’s working so well in health care, let’s try it everywhere. I am very familiar with the pain of being forced to purchase textbooks that are required, and sold in the bookstore at unrealistic prices. We are not paying for the research either, is what I learned from this article. Often times we pay the price, and the professor does not even use the book! Consumerism is the fuel for universities as a brand, and the high textbook prices kind of fall under the branding scheme. We have to accept it for what it is, and just have to accept it because we are in college to make more money in the future and so publishing companies feel entitled to make the prices as high as they want now seeing a show we will be paying them off for the next ten years anyway, and they are mandatory purchases. Companies like chegg relieve the burden of paying for books out of pocket for those of us without scholarships and that is worthy of respect in my book. Although I do not have to use them at this time because I am getting my bachelors on a G.I. Bill, it is great to know that I have honest resources such as this website that eliminate the need to purchase from the bookstore. It is even more reassuring to know that the government is aware of this issue and taking action. When I bought my books this semester I literally went to the bookstore and pulled up not only Amazon, but Chegg as well. It was so irritating having to do all this work just to buy a book that honestly, I may or may not open. I ended up actually buying half of my books on Chegg and Half of my books in the UNCW bookstore. The off campus bookstore was honestly no different than the one on UNCW’s campus. I feel as if it’s beyond ridiculous that we as students not only have to pay a crazy amount to be educated but have the stress of how we are going to pay this. As a junior in college, I barely have enough money to buy groceries yet alone textbooks that cost hundreds of dollars that I may or may not end up needing. Last semester I discovered chegg and will never go back to the bookstore. As stated in the article, without the retailers and distributors, students such as myself are saving a significant amount of money. The publishing companies know that in college we don’t have many options and will be forced to purchase these books regardless of the price and thus increase their prices to what they feel is necessary. I am fed up with these branding schemes and think that more companies like chegg should be created to help college students do what they came to college to do, learn. Great discussion. I usually end up renting all of my books used from the office campus bookstore and by just doing that I am able to save hundreds of dollars a year. I have heard of Chegg and that it may be even a cheaper option. I think I might try it out for next semester. The only thing that would hold me back is the time it could take to arrive versus how convenient the bookstores located in Wilmington are. Purchasing textbooks has become one of the biggest headaches with starting a new semester. I always wait until the semester starts before purchasing any books, because oftentimes, it says that it is a “required” textbook, when really only about 4 of the chapters are required. There have been too many instances where I buy or rent a textbook that sits on my desk and collects dust until the end of the semester when we are then informed that we need to read one chapter. More teachers are starting to realize that the textbooks are too expensive to buy and not use. I have had a few teachers who will buy the one or two chapters that we read and post them on BB for us to use instead or requiring the whole book to be purchased. Chegg and websites like it are definitely helpful when purchasing textbooks for some classes. However, I think the industry has already one upped us. Every year the number of classes that use access codes for online work increases. When you buy a code, it usually comes with the textbook but you also gain access to your class’s homework and other assignments. This is very frustrating because you can’t buy a used code or sell yours once the class is over. It’s a way for textbook companies to force students to pay the full price for their textbook each year. I understand that books prices are continuing to increase as time progresses. This is a serious inconvenience to me and other students who have enough trouble paying tuition and living expenses. I think that books should fall under the umbrella of tuition and the school should pay for the books they want us to use.